Posted on June 10, 2011 June 10, 2011 by Emily S.
it’s been an insanely rainy day today – cool and the type of day that makes you want to put on a sweater and – go nowhere. so what did i do? 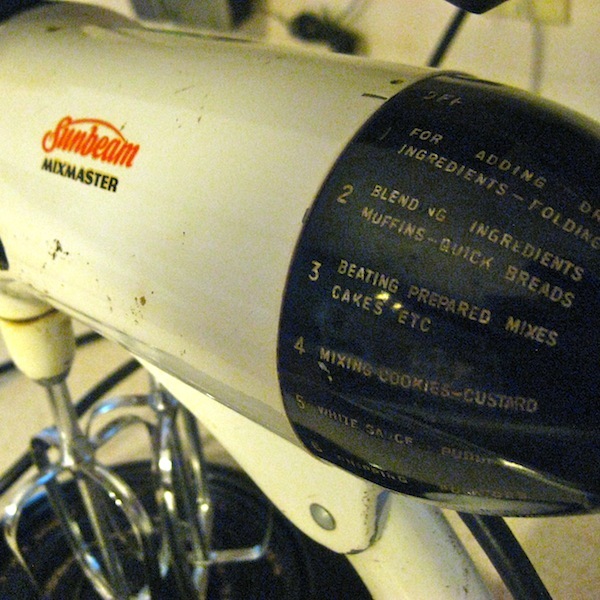 i visited my favorite thrift store and found the perfect rainy day item – a mixer. now, this isn’t any mixer. this is sunbeam’s leg up on kitchen aid. it’s a stand-up, it’s vintage, and it has descriptions of the type of mixing you should do on each setting! for instance, on setting 5 i should be whipping up white sauces and puddings. and watch out setting 7, that’s for whipping up salad dressings and mayonaise. oh, i love this mixer. it has big beaters that don’t mess around. when i plug it in, they’re raring to go. 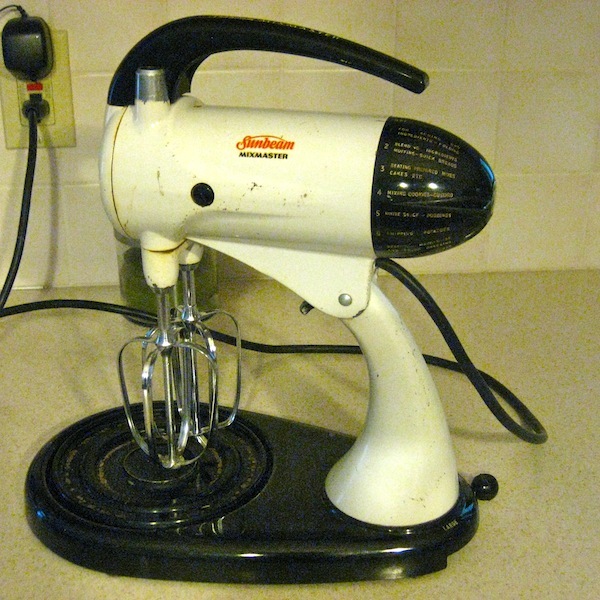 i wonder how many women have used this mixer to make food for their families or bake cakes for the church social hour. how many kitchens has this mixer sat in? more importantly, how fortunate am i, a terrible baker, to get to try my skills with this mixer? it makes me want to be a good baker – just so i can use it. the best part? everything was 40% off today at my favorite thrift store. this means that not only did i take advantage of the already ridiculous prices at this store, but i walked out of there feeling like i stole the thing! i got this lovely mixer and a skinny tie for chris all for a whopping $3.50. whoa. so, thanks friday for a day of insane deals that make me smile. and thanks weekend to allow me to mix up some lovely treats.